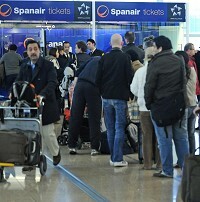 At least 22,000 passengers have been affected after an airline went bust, stranding customers at Spanish airports. Customers were left having to buy their own tickets to get home although they were allocated special lounges, said airports authority AENA. The disaster will have meant floods of calls by angry and frustrated travellers to travel insurance firms in a bid to obtain payouts. The company, Spanair, which flies within Spain and to Europe and Africa, had to cancel all future flights at just half an hour's notice "as a measure of caution and safety." But angry passengers were left queueing at an airport in Palma, Mallorca, last Saturday, although the situation was reported as normal at Madrid's Barajas airport and Barcelona's El Prat by AENA. Rival airlines including Iberia, Vueling and easyJet took on the stranded passengers.